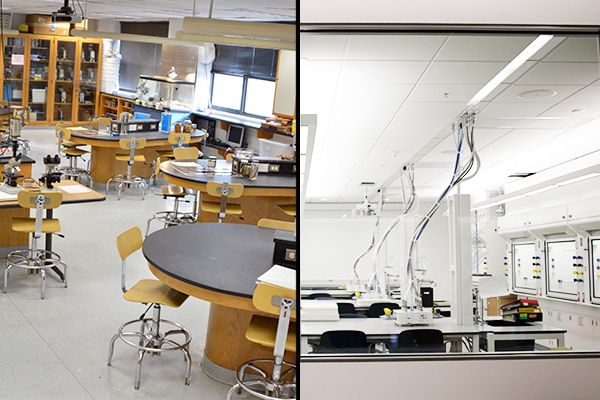 The biology department is divided between old labs in Bell Hall, left, and new labs in the Science and Engineering Hall, right. When administrators first began planning for the Science and Engineering Hall years ago, faculty in many Columbian College of Arts and Sciences departments were promised state-of-the-art facilities and offices in the new complex. But in the move, about half of GW’s biologists and physicists were left behind, while their counterparts with interdisciplinary research were selected to move into the $275 million building. That has left faculty with another challenge to face: holding together departments that have physically been spread across campus. Gustavo Hormiga, a biology professor, was originally going to move into the Science and Engineering Hall with the rest of his department. But when early in the process officials decided that the seventh and eighth floors of the building would instead go to the Milken Institute School of Public Health and the School of Medicine and Health Sciences, there wasn’t enough room for everyone originally promised a spot. He and nine other faculty members were left behind in Corcoran Hall, he said, with no clear picture of their future. Professors will have to manage two moves that will likely disrupt their research projects before they can settle into renovated labs and offices. Randall Packer, the chair of the biology department, said those faculty will likely have to move into Corcoran Hall while Bell Hall undergoes renovations, and then back into Bell when Corcoran is updated. Packer said he wants make sure he and his faculty members stay connected, even if they no longer have casual, daily encounters in the hallway. He said faculty meetings would alternate between the Science and Engineering Hall and Bell Hall, and he would split his time equally between the two buildings. But renovations are in the works. GW has committed millions of dollars to updating academic buildings, including Corcoran, Bell and Tompkins halls, over the next few years. Forrest Maltzman, the senior vice provost for academic affairs and planning, said the University is always trying to promote work within all departments. “While many of our departments have faculty located in different buildings, it is important that we recognize that space planning is important and that when faculty are located in different locations extra efforts need to be made to ensure cohesion,” he said in an email statement. Mollie Manier, an assistant professor of biology, said she was concerned about not being able to interact with other members of her department every day. She said the separation of her department, while it won’t have an effect on any ongoing collaborations, will make it more difficult to foster new ideas organically. Mark Reeves, a professor of physics, said his department is trying to replicate the environment that he and others previously had in Samson Hall. He said his mailbox was still in his old building, and the department’s weekly lunches would alternate between the two locations. He added that he and the other physicists in the building were encouraging students to visit the new facilities. All members of the chemistry department were moved into SEH, making collaborations within the department easier to manage. LaKeisha McClary, an assistant professor of chemistry, said getting to know members of other departments will become a major part of future projects. She added that, thanks to open spaces like kitchenettes that faculty from different departments share, she’ll soon be able to connect with professors she hadn’t had the opportunity to work with previously. “I think once everyone kind of gets settled this semester, or maybe over the summer, some of that reaching out and getting to know people and what they do and developing those collaborations will start to materialize,” she said. The new building includes lab and office space for researchers from the Columbian College of Arts and Sciences and the School of Engineering and Applied Science. And even though 63 percent of the labs are allocated to SEAS researchers, CCAS faculty have about 1,600 more square feet of lab space because of the spatial requirements of their research. Faculty were selected to move into the building based on the total number of research dollars they were able to bring in and how interdisciplinary their research was — criteria some faculty argued was too stringent. The number of dollars faculty secured from subsidized research also played a role in whether they landed a spot in the complex. Originally, officials planned to pull in $9 million from those types of funds, or indirect cost recoveries, to go toward funding the building’s construction. That figure has since been cut down to $1 million each year over the next 25 years after officials scaled back their projections. This isn’t the first hurdle the University has dealt with involving the Science and Engineering Hall. In November, GW announced that it would pay for the new building using only revenue from its commercial properties at The Avenue and debt after fundraisers failed to bring in enough donations. The move isn’t bad for all: This is the first time all of the University’s biological anthropologists are under one roof, and while they aren’t with the rest of the anthropology department, faculty said they’ll produce better work in the new location. The Center for the Advanced Study of Human Paleobiology has a new home on the sixth floor of the Science and Engineering Hall, which Chet Sherwood, a professor of anthropology, said will help students integrate more into the department. Tim Stearns, the chair of the biology department at Stanford University, said his top-ranked department has been split up among four buildings on the campus. He said architects will often consider the ways faculty interact when they’re designing facilities, but it’s often the promise of a new building that lures top researchers to the institution. All the space in the Science and Engineering Hall has already been assigned or remains under construction.